One of my favorite things about blogging is going to fun events and meeting other local creatives. 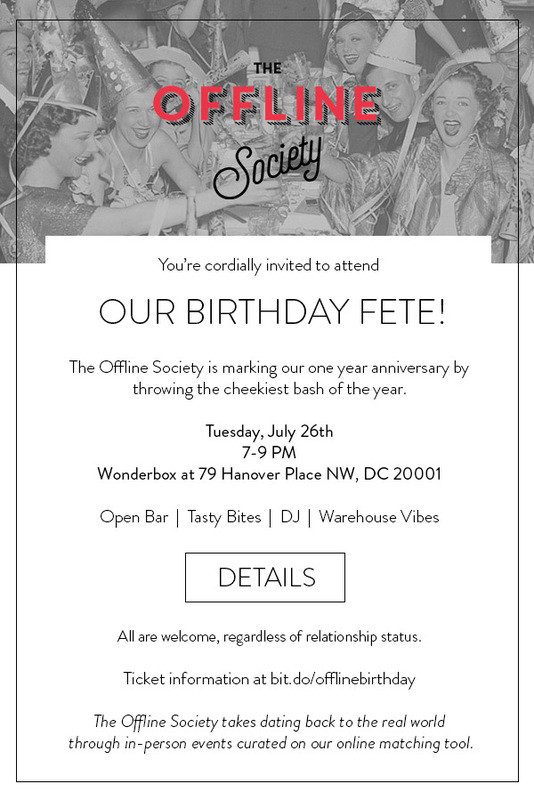 One company that is really different that you should all know about in DC is The Offline Society. The Offline Society is a dating startup but is also a great way to meet other singles in the area or just network and meet new people. The great thing about The Offline Society is that you meet people off-line (get it?). No messaging is involved you just meet others in person with pre-organized events that you know other singles/members will be at. Taken? No problem. The Offline Society events are not overtly "Hey! We are single here! Let's date!" type of gatherings so if you are taken and just want to check it out you won't feel out of place. They celebrating their first birthday next week and YOU ARE INVITED! A fun warehouse bash is happening on Tuesday with a DJ, open bar, photobooth, snacks, - they will have it all! And who doesn't love a good mid-week event to break up the week?